Zada is a powerful card and, as such, we can understand why the goblin ally was originally printed at rare back in Battle for Zendikar. BfZ is turning three years old this October, and over time, Wizards of the Coast have decreed that Zada’s power level is more silver than gold as reflected in Masters 25 that was released this past March. I am inclined to disagree, since I have considered Zada to be a very powerful bit of Magic ever since the card’s revelation, but then, who am I to say? Either way, there are a few things about Zada that excite the brewer in me. 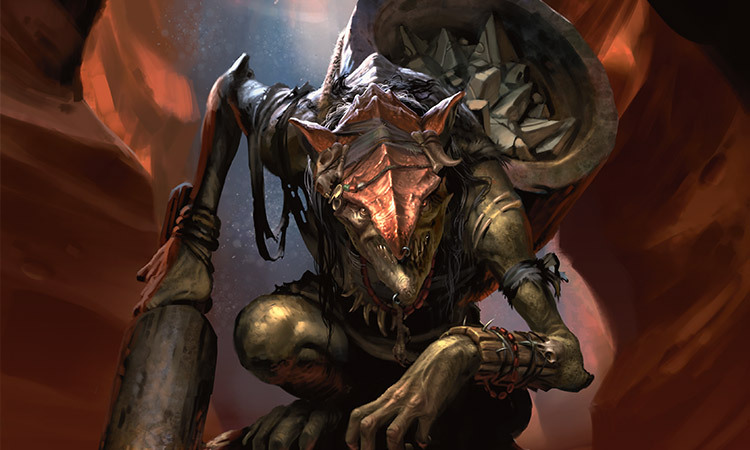 For one, the Hedron Grinder is a Goblin and anyone who knows me will remember that Goblins are right up in my top three favorite tribes with Vampires and Zombies. 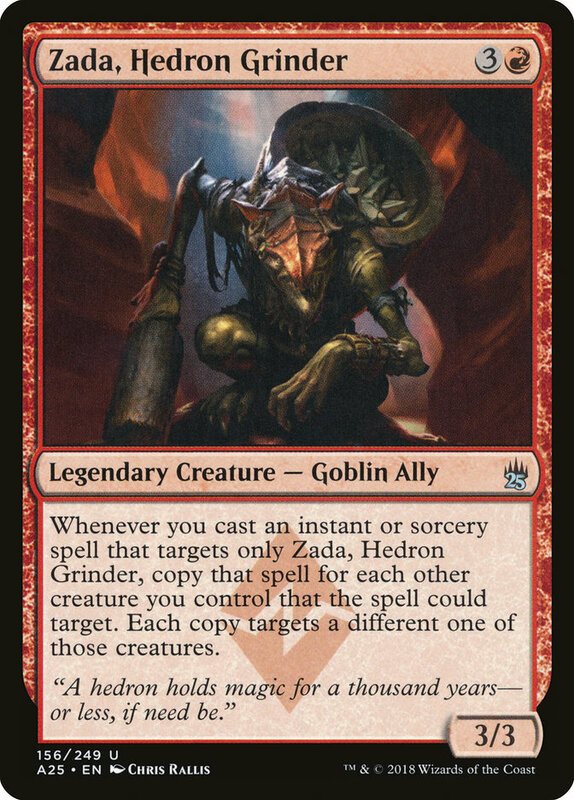 Not only that, but Zada’s ability to replicate effects that target just them to the rest of your field is amazing in a strategy where we want to go wide with lots of creatures, and Goblins are the best in the business at going wide. Fun fact: I play a large amount of my Magic via Magic Online MTGO and Zada is infamous for overwhelming and crashing the client via the sheer number of triggers on the stack. Zada and her Army of SURPRISE! I do want to point out how good previously sub-optimal cards are in a deck with Zada. Accelerate and Expedite are normally cantrips that really do not give too much other value for our field. With Zada, our entire field gets haste and because the entire spell is copied for each creature, that is potentially a large amount of cards to draw because of the second line on each of these spells. It is important to read our cards, though, since Zada’s ability is not a may or selective in how many copies of the spell we make, so there is potential that we can draw too many cards and deck ourselves out. Darn you, Magic: the Gathering for making us do math! For this series, I want to compare the strengths of the old commanders with the new ones and look at some of the cards that came out in Dominaria to see if any of these cards will find a permanent staple status home in the old decks. Zada presents a bit of a problem with that thinking, because her strategy is very linear. Go wide with as many tokens as we can pump out and then do single-target combat tricks on Zada that then replicates out to the rest of our army for surprise damage/effects. So it will be a challenge to try to find a way to make Zada unique in a way that our kitchen table friends will not see coming. One thing we can do to customize the deck is to focus on different types of creatures that can go wide. For example, going harder with Elementals instead of Goblins, or maybe even artifacts with the great support that the red color pie has for artifacts. 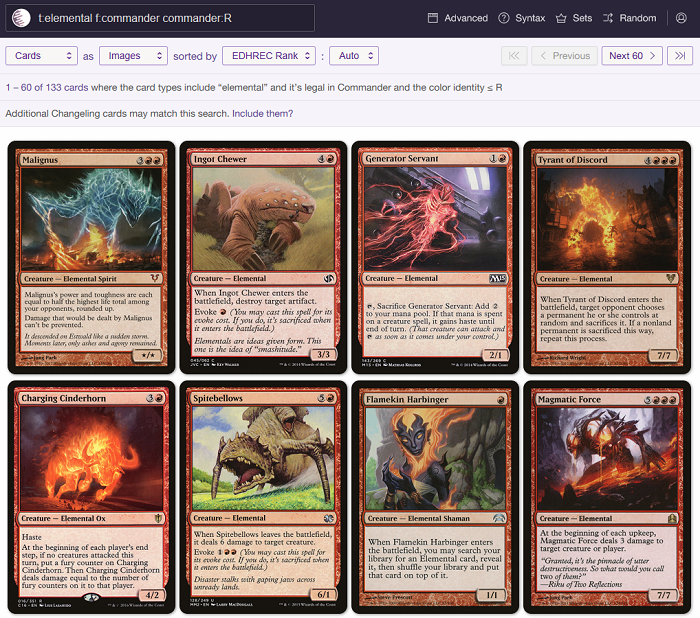 Cards from the original list like Young Pyromancer are a great place to start, and we can toss in some other things like Chandra, Flamecaller and Rakka Mar to make some elementals every turn. Tilonalli’s Summoner seems like it can get out of hand quickly once we have the City’s Blessing and something about the silly combination of Malignus enchanted with Elemental Mastery seems hilarious. Remember that EDHREC offers listings for different themes and tribes and Elementals are on the list. Since we are worried specifically about mono-red elementals, we can also use the EDHREC rank sorting on Scryfall after we search for creatures with the Elemental type that align with the mono-red color identity. When we first look at Zada, one might jump to the idea of playing the storm mechanic because it is easy to read her ability and think “Oh, wow, we get a huge storm count for copying anything we cast on Zada!” Unfortunately, however, if we check Zada’s rules listing via Scryfall.com, we can see that copied spells are not cast and therefore don’t add to the storm count. Still, fear not! Red has a good number of spells that grant us extra mana and we can try to pile these up to storm out. The two best storm cards to win with are either Grapeshot or Empty the Warrens. Grapeshot requires quite a large storm count while Empty the Warrens will be more effective with Purphoros, God of the Forge and Impact Tremors on the field. If we want to add some redundancy, we can toss in Warstorm Surge, Stalking Vengeance, and Goblin Bombardment to ensure the tokens we generate help us close out the game. The interesting part about the storm build is that Empty the Warrens can help facilitate the end game for Grapeshot by giving us a large mount of Goblin tokens, which then help us make enough mana to cast more spells and finish the table off with the damaging storm card. Since the classic Zada goes wide, Battle Hymn is a great way to generate mana to be able to start storming. Since so many of our tokens will be Goblins, Brightstone Ritual is great redundancy and Skirk Prospector should be in every Goblin token deck. Also, Thermopod does the same thing as Prospector but does not require the sacrificed creatures to be Goblins, so yay for redundancy! Meanwhile, other classics like Seething Song, Desperate Ritual, and Pyretic Ritual can also get us started. Goblins tend to be expendable, so even spells like Infernal Plunge are great ways to add mana to our pool. Let us also not forget one of the greatest (and still new) cards for mono-red to generate mana, Neheb the Eternal. We could run Aggravated Assault for the infinite mana trick, but if we manage to oops into the combo, we probably do not need a storm count anymore and we are going to win the game anyway. 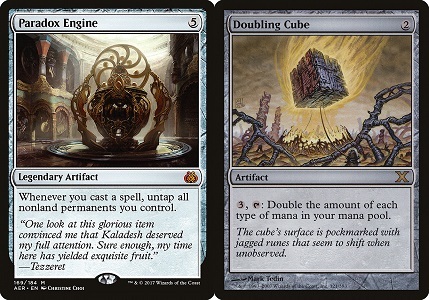 Of course, no deck that wants to storm off is complete without Paradox Engine to let us make silly amounts of mana and Doubling Cube almost feels like a “win more” combination. Similar to how we are planning to have many Goblin tokens, another thing we are going to have a lot of is Mountains, so why not get double mana by activating the -2 ability on Koth of the Hammer? (Another fun fact, this is one of my all-time favorite Planeswalkers in the entire game!) We can add in redundant, permanent doubling effects like this with Caged Sun, Gauntlet of Power, and Gauntlet of Might. Finally, cards that allow us to copy spells are great for not only adding to our storm count, but potentially copying our storm wins. Reiterate, Reverberate, Pyromancer’s Goggles, Primal Amulet’s other side Primal Wellspring, and even Increasing Vengeance can make all the difference in the world when closing out the game. Ever since I started my first series, there have been commanders that I write about that get me stumped for a little while. Either they seem to be structured in a way that I do not normally interact with, given my play style, or like Zada, they are very linear strategies. These kinds of articles, ironically, become my favorites in the different series because of the feeling of overcoming an obstacle with a challenging build. I hope you enjoyed the ravings of a madman today and I hope you spot all the combos in my Krenko deck! Do not forget to let me know below in the comments! Also, I will most likely be deciding which Dominaria Uncommonder to write about next via a Twitter poll, so make sure you are following me via @DM_Cross! Until next time, keep top-decking those bombs and see you next time!